The Kreg Jig Jr. (R3) Is An Amazing Repair Jig And An Exceptionally Handy Addition To Any Tool Collection. Whether You're Crawling Under A Table To Make A Quick Repair Or Taking Kreg Joinery On The Road, The Jr.'S Compact Design Lets You Work Where You Need To Most, And It Gives You What You Need To Start Building Wood Joints That Will Last The Life Of Your Creation. The Kreg Jig Jr. Is An Amazing Repair Jig With A Compact Design That Lets You Work Where You Need To Most. Thanks To Its Clamp Pad Adapter, The Jr. Can Be Secured To The Workpiece With Any Standard Bar Clamp Or C-Clamp. 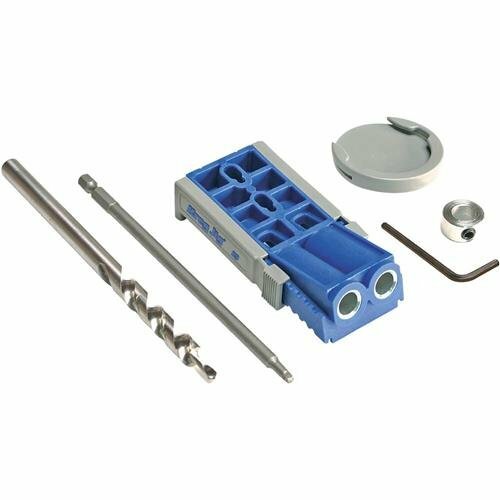 In Addition, The Adapter Allows The Jig To Be Attached Directly To Any Kreg Face Clamp (Sold Separately) For Faster And More Repeatable Pocket-Holes. From Thin Drawer Boxes And Craft Projects To Stout 2X4'S, This Jig Can Handle Them All. Independent Easy-Press Positioning Sliders Feature Nine Separate Depth Settings, Allowing You To Easily Join Materials From 1/2-Inch To 1-1/2-Inches Thick In 1/8-Inch Increments. And To Set The Jig Properly, You Simply Depress The Button On The Side Of The Jig And Move The Sliders So Your Material Thickness Is Aligned With The Arrow On The Jig Body. It Couldn't Be Any Easier. The Kreg Jig Jr. Includes A Compact, Durable Plastic Carrying Case That Will Ensure That You Always Have The Tool, Drill Bit, And Screws On Hand To Complete Your Next Project.